Today's Retro Review is a special request from Blogorium regular Cranpire, who asked me to write about "anything with Chi McBride." Specifically, he asked for Let's Go to Prison, but it's hard to write a movie where I look back at something I never saw the first time around. He also mentioned Baby Mama, which I did see, but that doesn't appear to have Chi McBride in it. So while refreshing my memory about what Chi McBride movies I have seen (answer: not many) on IMDB*, I remembered he was in The Frighteners, and as it's October that makes sense to take a look back at. 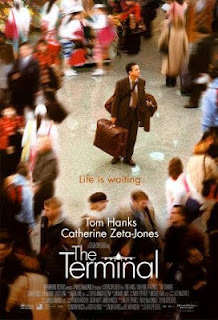 But instead I'm going to write about Steven Spielberg's The Terminal. I don't remember much about The Terminal because I saw it on DVD seven or eight years ago and while it was pleasant I would not consider it to be of a "higher quality" Steven Spielberg joint. It's like mid-level Spielberg, somewhere between Hook and Always. Not as bad as 1941 but not in the same league as the much better movie he made before this, Catch Me If You Can. It's definitely not a movie that anybody's going to mention in Spielberg or Tom Hanks' obituary. Chi McBride's, maybe. So Chi McBride plays Mulroy, who if I remember correctly is one of the guys who works in the baggage claim / behind the scenes mechanic stuff with Diego Luna (Cas de Mi Padre) and who befriends Viktor Navorski (Hanks), the foreign guy trapped in the airport because the fictional country he comes from no longer exists and he therefore cannot leave the terminal and go to America or be sent home. Why this was a movie and not a sitcom, I'm not sure, but now that I've mentioned this fact we can look forward to it on ABC next fall. And yes, it's based on a true story about an Iranian who lived in a French airport for 17 years because somebody stole his passport, but that's not going to stop sitcom shenanigans. Tom Hanks is clearly playing eastern European in the movie, and people love eastern European stereotypes (see: Perfect Strangers). Honestly I can't remember what Chi McBride's story arc is, so I'm just going to assume he's involved in helping Viktor to woo Enrique (Luna)'s love interest, Dolores Torres (Zoe Saldana) by appealing to her love of Star Trek. I wonder if JJ Abrams saw The Terminal and thought "Huh. Well, that was okay, but I think I found my new Uhura for the Star Trek remake I'll direct in five years!" Stranger things have happened (see: The Terminal sitcom next fall on ABC). They are successful, or at least more successful than Viktor is at wooing Amelia (Catherine Zeta-Jones), which if I remember correctly doesn't pan out. Sometimes it's too much to ask for a stewardess (pardon me, flight attendant) to fall in love with a Krakozhian. Even back then I wondered why this movie needed to be two hours long, and as impressive as the terminal is (and it's a set) and the actors being fine and all, the script by Andrew Niccol (In Time) just doesn't need to be this long. I forgot I was supposed to care about the box of photos of jazz musicians that Viktor is carrying around (is that right? I'm just going to pretend it is and somebody can correct me in the comments) and it just felt like one of those contrivances to keep this movie from seeming as trivial and formulaic as it is. And it's not like I hated The Terminal, I just didn't think it was all that impressive. Catch Me If You Can, which has an as arguably gimmicky "true story" premise, manages to pack in more genuine emotion and unexpected twists and turns and while I didn't like Minority Report it looked like a different movie than Spielberg usually makes. Mind you, Munich pretty much removed any questions about whether the director was taking it easy during the mid-2000s, so The Terminal is just kind of there. It's a movie people don't mention much, but I bet Chi McBride doesn't mind putting it on his filmography. I mean, he's worked with Peter Jackson and Steven Spielberg. I mean, no offense Dominic Sena**, but their track records are a little better. * He was also in I, Robot, Undercover Brother, and a bunch of movies I never saw because they were Mercury Rising, Waiting..., Still Waiting..., Cradle 2 The Grave, Roll Bounce, Annapolis, and Revenge of the Nerds Part III. ** But in all seriousness, Mr. Sena, I did like Kalifornia a lot when I saw it in high school. Haven't seen it since but I bet it's still pretty good.